Pastırma or basturma, also called pastourma bastırma, as well as basterma, is a highly seasoned, air-dried cured beef that is part of the cuisines of a number of countries. The word pastırma comes from the Turkish verb bastırmak which means "to press". The origin of that word is from Ancient Greek παστός (pastós, “sprinkled with salt, salted”). The Oxford Encyclopedia of Food and Drink writes that pastırma is the word Ottomans used for a type of Byzantine cured beef that was called paston in Greek. The Oxford Companion for Food says that a Byzantine dried meat delicacy was "a forerunner of the pastirma of modern Turkey". According to Johannes Koder, an expert in Byzantine studies, paston could mean either salted meat or salted fish, while akropaston means salted meat. Andrew Dalby gives the definition of paston as "salted fish" and akropaston apakin as "well-salted fillet steak". Gregory Nagy gives the definition of akropaston as "smoked", describing apakin as "a kind of salami sausage, probably similar to pastourma". Other scholars have given different accounts of the historical origins of the Ottoman pastırma. The armies of settled, agricultural peoples had cereal based diet, and some Turkish and Bulgarian scholars have written that certain medieval fighters who kept dried and salted meat under their saddles had an edge over opponents who ate mostly cereals. Ammianus Marcellinus wrote that the Huns warmed this meat by placing it between their legs or on the backs of their horses. Clifford Wright, a recipient of the James Beard Cookbook of the year award has written that pastırma is "originally from Turkey or Armenia". Pastırma is mentioned in Mahmud of Kashgar's Diwan Lughat al-Turk and Evliya Çelebi's Seyahatname. The word pastrami may be a Yiddish construction that combined salami with pastırma or one of the similar linguistic variations of the word (pastramă in Romanian, pastromá in Russian and basturma in Armenian). Pastırma is usually made from water buffalo or beef, but other meats can also be used. In Egypt pastırma is made not only with beef, but with lamb, water buffalo, goat and camel as well. Some pastırmas are made with horsemeat. Different cuts of meat may be used; a single cow can produce 26 different "types" of pastırma. Fillet, shank, leg and shoulder cuts are used for the best quality pastırmas. It is usually made during the months of October and November. To make pastırma the meat is salted and rinsed before being dried and pressed. After the first drying period the meat is cold pressed for up to 16 hours. This aids the process of removing moisture from the meat. After the first pressing, the meat is dried for several days during which the fats melt and form a white layer. The second press is a "hot press". Finally, the dried and pressed meat is covered with a spice paste called çemen. Çemen is made from a paste of ground fenugreek seeds, Turkish red pepper and mashed garlic. The dried product is covered with the wet paste and left to dry again. The entire process takes approximately one full month. Pastırma is classified as an "intermediate moisture food". Lowering the moisture level is a form of food preservation that hinders the growth of microorganisms, and the çemen paste "is used to control surface mold growth during storage". Other functions of the çemen include improved flavor, characteristic red coloring, prevention of further drying, and antimicrobal effects. Ottoman cuisine was not only the product of Muslim citizens of the Ottoman Empire; it was also influenced by Ottoman Christian and Jewish citizens. Today, it includes the cuisines of Armenia, Egypt, Greece, Israel, Turkey and the Levant. The cured meat, which resembles Italian bresaola, is called basturma or abouhkd by Armenians. According to the LA Times Sahag's Basturma, an Armenian deli in East Hollywood, is "best place to try basturma in Los Angeles, and possibly anywhere". The owner of Sahag's says that his family, who first began making basturma in Lebanon, have made basturma for three generations. His shop serves basturma as a sandwich on french bread with pickles and onions. Some Armenian-owned pizzerias in cities like Yerevan, Boston and Los Angeles serve basturma topped pizza. According to Nigol Bezjian, Armenians who survived the 1915 genocide brought basturma with them to the Middle East. 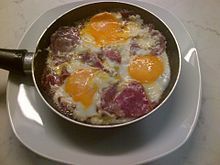 Bezjian recalls that his grandmother used to prepare "basturma omelets fried in olive oil with pieces of lavash bread". He notes that Armenians from Kayseri were particularly renowned basturma producers. Arabs mocked Armenians with phrases like "It smells like there is basturma here", referring to the strong smell of basturma that is produced by the garlic and fenugreek mixture that the meat is coated in during preservation. Shoushou, a well-known Lebanese comedian of the 1960s-70s, portrayed a caricature of an Armenian basturma seller; he retired the character after local Lebanese Armenians complained. In Palestine, where Armenians have lived for 1,500 years, Armenian families gather on New Year's Eve and eat traditional foods including basturma, çiğ köfte and a traditional Anatolian confection called kaghstr sujukh (քաղցր սուջուխ). In Turkish cuisine pastırma can be eaten as a breakfast dish and it is a commonly ingredient for omelettes, menemen (Turkish-style shakshouka) or a variation of eggs benedict. Pastırma may also be served as a meze small plate appetizer accompanied by alcohol like the traditional anise-flavored liquor called rakı. Pastırma can be used as a topping for pide bread, hamburgers, and hummus. It can be as a filling for a "burek" that is made with kadayıf instead of the traditional filo dough. It may be combined with potato to make a filling for traditional bureks as well. It is also a common addition to many of the traditional vegetable dishes, especially the tomato and fava bean stew called kuru fasulye, but also cabbage (pastırmalı lahana), chickpeas (pastırmalı nohut), asparagus (pastırmalı kuşkonmaz) and spinach (pastırmalı ıspanak). It can also be used to make cheesy pull-apart bread. Turkey produces around 2041 tons of pastırma each year. The pastırma from Kayseri is particularly well known. In their 1893 report the British Foreign Office note that Kayseri, which they call Cesarea, "is specially renowned for the preparation of basturma (pemmican)". In Kastamonu, which produces around 200 tons of pastırma each year, çemen is made using garlic that is locally produced by the farming villages of Taşköprü. Armenians are well-known for their culinary arts and their pastırmas are highly regarded. ^ Ramesh C. Ray; Montet Didier (21 August 2014). Microorganisms and Fermentation of Traditional Foods. CRC Press. p. 263. ISBN 978-1-4822-2308-8. ^ Sameh Wadi (14 April 2015). The New Mediterranean Table: Modern and Rustic Recipes Inspired by Traditions Spanning Three Continents. Page Street Publishing. p. 82. ISBN 978-1-62414-104-1. ^ Ghillie Basan (2007). Middle Eastern Kitchen. Hippocrene Books. p. 198. ISBN 978-0-7818-1190-3. ^ a b c Kilic, Birol (2009). "Current trends in traditional Turkish meat products and cuisine". LWT - Food Science and Technology. 42 (10): 1581–1589. doi:10.1016/j.lwt.2009.05.016. ISSN 0023-6438. ^ a b Gagaoua, Mohammed; Boudechicha, Hiba-Ryma (2018-06-01). "Ethnic meat products of the North African and Mediterranean countries: An overview". Journal of Ethnic Foods. 5 (2): 83–98. doi:10.1016/j.jef.2018.02.004. ISSN 2352-6181. ^ Brubaker, Leslie; Linardou, Kallirroe (2007). Eat, Drink, and be Merry (Luke 12:19): Food and Wine in Byzantium : Papers of the 37th Annual Spring Symposium of Byzantine Studies, in Honour of Professor A.A.M. Bryer. Ashgate Publishing, Ltd. p. 47–62. ISBN 978-0-7546-6119-1. ^ Dal, Andrew (2010-06-30). Tastes of Byzantium: The Cuisine of a Legendary Empire. I.B.Tauris. p. 189. ISBN 978-0-85771-731-3. ^ Nagy, Gregory (2014-01-02). Greek Literature in the Byzantine Period: Greek Literature. Routledge. ISBN 978-1-136-06626-9. Archived from the original on 2018-07-28. Retrieved 2018-07-18. ^ Dalby, Andrew (1992). "Greeks abroad: social organisation and food among the ten thousand". The Journal of Hellenic Studies. 112: 16–30. doi:10.2307/632150. ISSN 0075-4269. JSTOR 632150. ^ Wright, Clifford (2003-09-26). The Little Foods of the Mediterranean: 500 Fabulous Recipes for Antipasti, Tapas, Hors D'Oeuvre, Meze, and More. Harvard Common Press. ISBN 978-1-55832-227-1. ^ a b c Kaban, Güzin (2013-12-01). "Sucuk and pastırma: Microbiological changes and formation of volatile compounds". Meat Science. 59 th International Congress of Meat Science and Technology , 18-23 August 2013 Izmir/Turkey. 95 (4): 912–918. doi:10.1016/j.meatsci.2013.03.021. ISSN 0309-1740. PMID 23608196. ^ harry g. levine (2007). "pastrami land: the jewish deli in new york city". Contexts. 6 (3): 67–. doi:10.1525/ctx.2007.6.3.67. JSTOR 41801065. ^ Lorenzo, José M.; Munekata, Paulo E. S.; Campagnol, Paulo Cezar Bastianello; Zhu, Zhenzhou; Alpas, Hami; Barba, Francisco J.; Tomasevic, Igor (2017-12-01). "Technological aspects of horse meat products – A review". Food Research International. 102: 176–183. doi:10.1016/j.foodres.2017.09.094. ISSN 0963-9969. PMID 29195938. ^ Toldra¡, Fidel (2014-10-27). Handbook of Fermented Meat and Poultry. John Wiley & Sons. ISBN 978-1-118-52267-7. ^ Hui, Y. H.; Evranuz, E. Özgül (2012-05-14). Handbook of Animal-Based Fermented Food and Beverage Technology, Second Edition. CRC Press. ISBN 978-1-4398-5022-0. ^ Nazilli Ticaret Odası. Kurutulmuş Toz Biber Üretimi - Bozdoğan. Archived from the original on 2018-07-28. Retrieved 2018-07-18. ^ a b Sych, J. (2003-01-01). "Intermediate Moisture Foods". Encyclopedia of Food Sciences and Nutrition (Second Edition). Oxford: Academic Press. pp. 3337–3342. ISBN 978-0-12-227055-0. Retrieved 2018-07-18. ^ Yetim, Hasan; Sagdic, Osman; Dogan, Mahmut; Ockerman, Herbert W. (2006). "Sensitivity of three pathogenic bacteria to Turkish cemen paste and its ingredients". Meat Science. 74 (2): 354–358. doi:10.1016/j.meatsci.2006.04.001. ISSN 0309-1740. PMID 22062846. ^ Erkmen, Osman; Bozoglu, T. Faruk (2016-04-13). Food Microbiology: Principles into Practice. John Wiley & Sons. ISBN 978-1-119-23784-6. ^ "Osmanlı/İstanbul mutfağı üzerine". Retrieved 2018-11-18. ^ Gur, Janna (2008). The Book of New Israeli Food: A Culinary Journey. Schocken Books. ISBN 978-0-8052-1224-2. ^ a b c d Bezjian, Nigol (2009-08-18). "Bezjian: Travels with Basturma". The Armenian Weekly. Retrieved 2018-11-18. ^ Gold, Jonathan (1996-04-04). "Basturma Boss". Los Angeles Times. ISSN 0458-3035. Retrieved 2018-11-18. ^ Duguid, Naomi (2016-09-06). Taste of Persia: A Cook's Travels Through Armenia, Azerbaijan, Georgia, Iran, and Kurdistan. Artisan Books. ISBN 978-1-57965-727-7. ^ "Panem et Circenses - This Week in Palestine". Retrieved 2018-11-18. ^ Arda'nın Mutfağı. Yumurtanın En Lezzetli Hali - Eggs Benedict Tarifi - Arda'nın Mutfağı. Archived from the original on 2018-07-31. Retrieved 2018-07-31. ^ Migros Türkiye. Pastırmalı Yumurta Tarifi. Archived from the original on 2018-07-31. Retrieved 2018-07-31. ^ "Pastırmalı Menemen". Sabah. Retrieved 2018-11-18. ^ Pastırmalı Pide Tarifi. Nursel'in Evi. Archived from the original on 2018-07-28. Retrieved 2018-07-18. ^ Pastırmalı Hamburger ve Lahana Salatası Tarifleri. Arda'nın Mutfağı | 1.Bölüm (01.11.2015). Retrieved 2018-07-18. ^ Pastırmalı Humus Tarifi. Nursel'in Evi. Retrieved 2018-07-18. ^ Pastırmalı Kadayıf Böreği Tarifi. Pelin Karahan'la Nefis Tarifler. Retrieved 2018-07-18. ^ Migros Türkiyeundefined (Director). Patatesli Pastırmalı Rulo Börek. Retrieved 2018-07-31. ^ Migros Türkiyeundefined (Director). Pastırmalı Kuşkonmaz Tarifi. Event occurs at 119 seconds. Retrieved 2018-07-31. ^ Gurme Tarifler-Pastırmalı Ispanaklı Sote. TV Kayseri. Retrieved 2018-07-18. ^ Halıcı, Feyzi (1991). Üçüncü Milletlerarası Yemek Kongresi: Türkiye, 7-12 Eylül 1990. Konya Kültür ve Turizm Vakfı. ISBN 978-975-95525-1-0. ^ Migros Türkiye. Pastırmalı Kaşarlı Somun Ekmek Tarifi. Event occurs at 99 seconds. Retrieved 2018-07-31. ^ Show TV. Turgay Başyayla ile Lezzet Yolculuğu Kayseri'de. Archived from the original on 2018-07-28. Retrieved 2018-07-18. ^ Office, Great Britain Foreign (1894). Diplomatic and Consular Reports: Annual series. p. 5. Archived from the original on 2018-07-28. Retrieved 2018-07-18. ^ Tarım TV. Sarımsağı kadar pastırması da ünlü. Archived from the original on 2018-07-31. Retrieved 2018-07-31. ^ Zubaida, Sami; Tapper, Richard; Roden, Claudia (2000). A taste of thyme: culinary cultures of the Middle East. Tauris Parke Paperbacks. p. 35. ISBN 978-1-86064-603-4. Alan Davidson, The Oxford Companion to Food. Oxford University Press, Oxford 1999. ISBN 0-19-211579-0. Maria Kaneva-Johnson, The Melting Pot. Balkan Food and Cookery, Prospect Books, 1995. ISBN 0-907325-57-2. This page was last edited on 21 April 2019, at 20:48 (UTC).